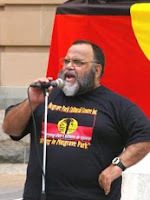 Sam Watson, Queensland Murri leader and Socialist Alliance Senate candidate in the coming Australian federal elections, condemned the recent raids by New Zealand police on the homes of Maori and other social movement activists, in a statement released on October 24. The raids by more than 300 police, many armed, were carried out on the morning of October 15, in cities and towns the length and breadth of NZ. “These ‘anti-terror’ raids by NZ police are nothing more than the brutal, racist use of repression against Maori and other political activists,” Sam Watson said. “Indigenous people in Australia, who recently suffered a military invasion of their lands in the Northern Territory, by the Howard government, condemn these acts of aggression by the NZ state. “We understand, and fully support, the movement by Maori activists to stand up for their social and land rights, stolen by the NZ government over many decades. We protest the use of police repression and violence in Aotearoa, just as we have stood up against police killings and legal discrimination here in Australia – most recently in the case of Mulrunji Doomadgee on Palm Island. “We stand shoulder to shoulder with the indigenous communities of Aotearoa in their continuing struggle for their rights, and call for the dropping of all these unjust and trumped-up charges by the NZ police. Socialist Alliance is a front for Australia's largest Marxist-Leninist organisation, the Democratic Socialist Perspective. The DSP is in turn closely allied to New Zealand's Socialist Worker. The DSP was also recently the main organiser of the Pacific International Solidarity Forum which was addressed by another arrestee solidarity activist Sina Ana Brown-Davis.